Winter at Point Lookout, the easternmost point of land on the south shore of Long Island, New York, before one reaches Jones Inlet, can provide wildlife watchers with a plethora of pleasing options. One of my favorites species to see at Point Lookout since the first time I saw them there has been the gaudy and well-named Harlequin Ducks, and I try whenever I can to share them with others (though sometimes the ducks don’t want to be found). When Harlequin Ducks do come into my field of view it somehow always seems to me that each individual Histrionicus histrionicus is aware of the attention it is getting so it treats the entire world like a stage, constantly putting on a show for the groundlings holding high-powered optics. 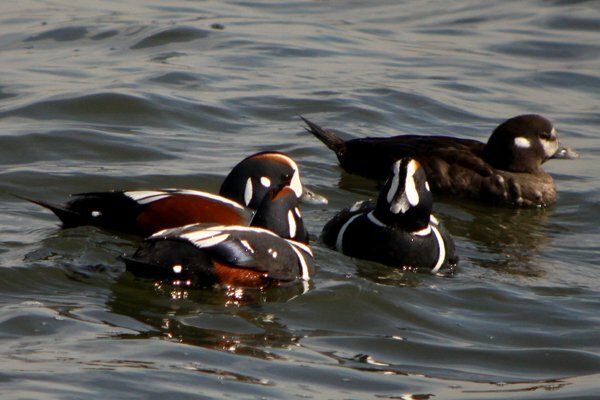 Point Lookout is easily the best place in New York to see Harlequin Ducks, though if you are from New Jersey you will likely choose Barnegat Lighthouse and if you are a Bay Stater you will go to Granite Pier. Wherever you seek your Harlequin Ducks make sure you leave plenty of time to watch them and if they disappear for a bit be sure to call for an encore! All of these shots were digiscoped yesterday at Point Lookout. I kept my distance both because I didn’t want to disturb the eight ducks, which is the most I have ever seen in New York at one time, and because slippery breakwaters are dangerous. Enjoy! For more photo-galleries on a wide variety of birds see our photo-galleries page, 10,000 Clicks. No! Nonononono!!! I reject your post about having seen 8 Harlequins last weekend the way you did. I’ll deny it access to my brain. That’s a nice number for Pt. Lookout these days. There haven’t been that many there for a while. Great photos! @Shawn: I was pretty happy with finding 8. I’m pretty sure that it is the high count for the region this winter.